As we begin a New Year and find McKendree University in the opening days of a new semester, I think it fitting our magazine has as its focus, service. At McKendree we define service in all of these ways and many more. 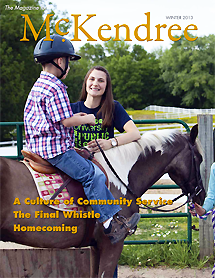 This issue of The Magazine for McKendree showcases the service provided by our students, faculty and staff assisting many who are in need of care, kindness, food, clothing, tutoring, and a kind word or smile. The service provided to the broader community by McKendree is far-reaching. Last year a staggering 23,623 hours of service were given by 2,231 students. A total of 14,000 hours of service was provided by just over 600 students who are enrolled in Service Learning courses. These unique courses include a service component to class readings, lectures and instruction, and they are increasingly popular with our students. In addition, students were also very active with our Lyn Huxford Center for Community Service, through programs like “Into the Streets,” which is part of our first-year orientation weekend, and a number of other programs. McKendree is extremely proud of our repeated recognition on, and inclusion in, the President’s Higher Education Community Service Honor Roll—now five times. This recognition is given by the Corporation for National and Community Service, a federal agency that engages more than 4 million Americans in service through Senior Corps, AmeriCorps, and the Social Innovation Fund, and leads President Obama’s national call to service initiative, United We Serve. This affirmation of the work we are doing is exciting, but even more exciting will be the stories and photographs waiting for you on the pages that follow. In a period of history when our society is often besieged with the negative things we hear young people are doing, it is wonderful to be able to share stories of McKendree students making a difference in our broader community and world. Each time I hear about the remarkable contributions McKendree students, faculty and staff are making, I am inspired by them and honored to call them friends. Perhaps their stories will inspire you to look for ways in which you can make a difference in the community in which you live and work in 2013.